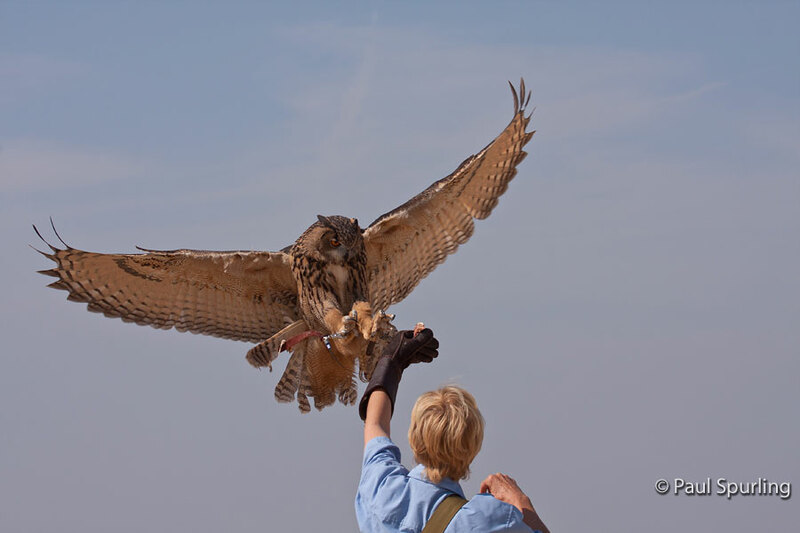 Eurasian Eagle-owls combine fast and powerful flights with shallow wing beats and long, fast glides. They also soar on updrafts, displaying a type of flight similar to that of soaring hawks like the Red-tailed Hawk. Eurasian Eagle-owls are among the world's largest owls. Their pumpkin orange eyes and feathery ear tufts make them one of the most striking owls in the world. 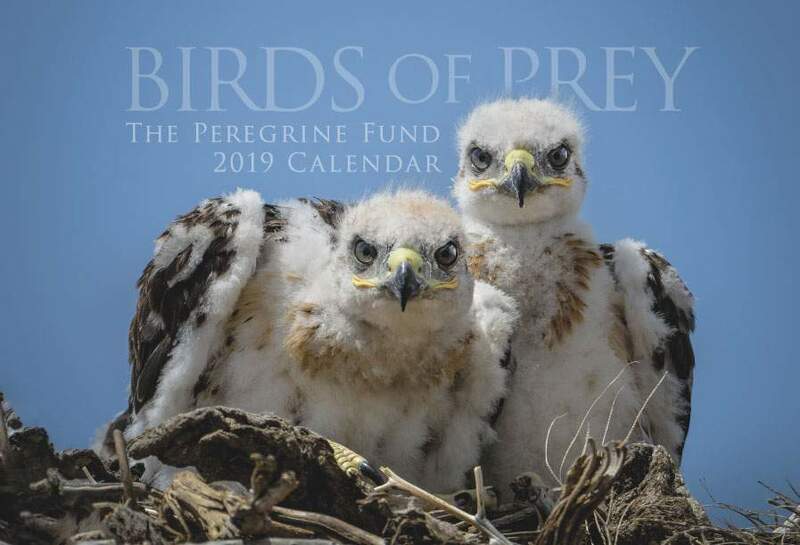 The Peregrine Fund doesn't work directly with this species, but our efforts in scientific research, habitat conservation, education, and community development help conserve raptors around the world. We also supply literature to researchers from our avian research library, which helps scientists around the world gather and share important information on raptor conservation. Eurasian Eagle-owls are found throughout much of Europe and Asia and in parts of northern Africa. They live in a variety of wooded habitats. They are more commonly found in areas with rocky outcrops and cliffs, but they also live in open habitats that have some trees and rocky areas like taiga, farmlands, steppes, semi-arid areas, and grasslands. Eurasian Eagle-owls seem to do well in most types of habitat if there are available nesting spots and adequate prey. These large, beautiful owls have even been documented living in city parks. One owl showed up at the Helsinki Olympic Stadium in Finland. This potential fan spent time hanging out on the goal post, causing the game to be postponed for several minutes! 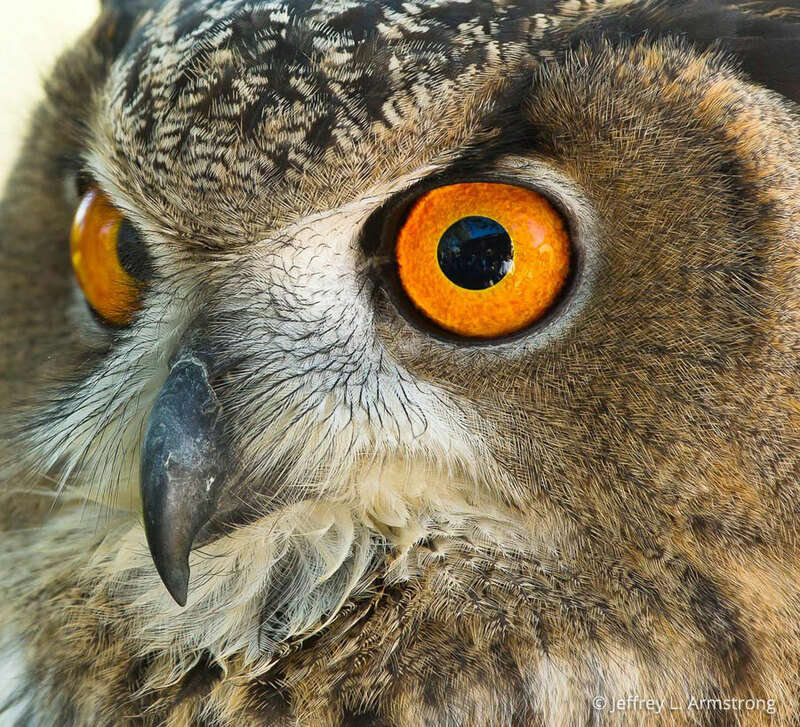 With their bright orange eyes, mottled feathers, and "ear tufts," Eurasian Eagle-owls are visually striking animals. Their large, powerful feet and strong flight makes them powerful hunters. Like many raptors, these owls are top predators – they hunt other animals for food but no animals hunt them on a regular basis. They are unlike snakes, for example, which prey on mice, birds, and other animals but also are preyed upon by animals that feed on them. For most top predators, their only threat is humans. Top predators, such as the Eurasian Eagle-owl, play an important role in nature by helping to control populations of prey animals and maintain a balance in the ecosystems where they live. Eurasian Eagle-owls are mostly nocturnal, or active at night. They spend their days roosting, or resting, in a safe perch. If they spend too much time on the ground, even these top predators may fall prey to opportunistic ground predators like foxes. It is believed that these owls can live to be around 20 years old in the wild. 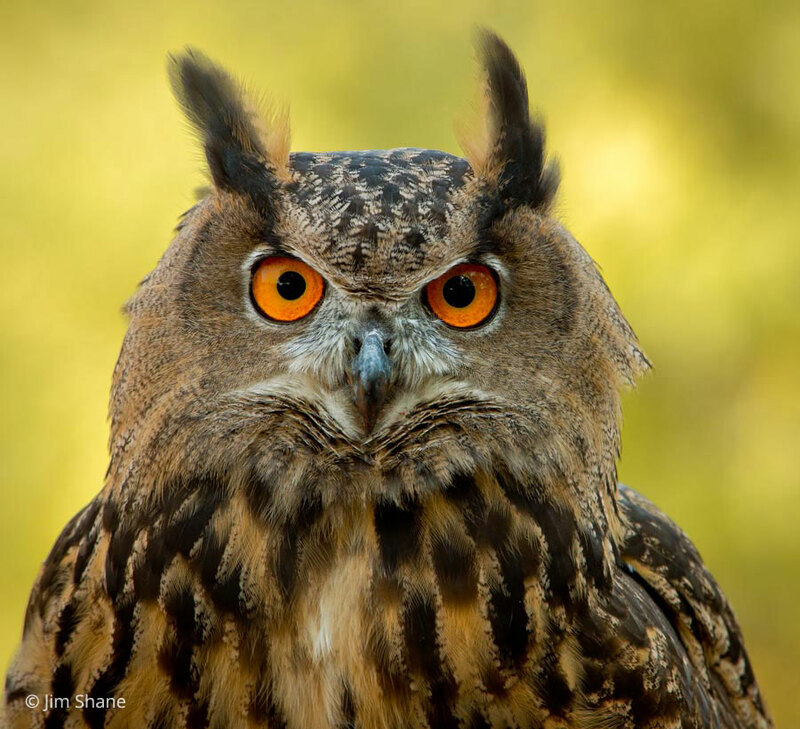 During the first half of the 1900s, Eurasian Eagle-owl populations declined drastically. Humans hunted and poisoned them and, as you can imagine, they had a hard time surviving. Happily, local governments have begun to increase their protection of these owls, and some reintroduction programs have taken place. 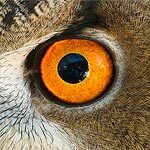 Thanks to these efforts, the Eurasian Eagle-owl is recovering in Europe although their numbers still haven't returned to what they were before the mid-1900s. Electrocution and collisions with cars continue to be a problem for this extraordinary raptor. Eurasian Eagle-owls are not picky eaters. They mainly eat small mammals such as voles, rats, and rabbits but also hunt woodpeckers, herons, and other birds, including other raptors. They also prey on amphibians, reptiles, fish, and insects. Eurasian Eagle-owls usually hunt at night from a perch or while flying low over the ground or treetops. 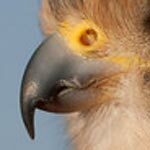 They are silent hunters that use their keen eyesight and hearing to locate and capture prey. Like other owls, and some other raptors, Eurasian Eagle-owls are equipped with a facial disk, a group of feathers around their heads that helps direct sound to their ears. To get an idea of how it works, cup your hands behind your ears and listen – sounds will be louder and clearer. Owls can raise these feathers slightly when on the hunt, allowing them to hear the rustle of a mouse in the grass, the flapping of feathers in the night, or the slithering of a snake in a tree branch. 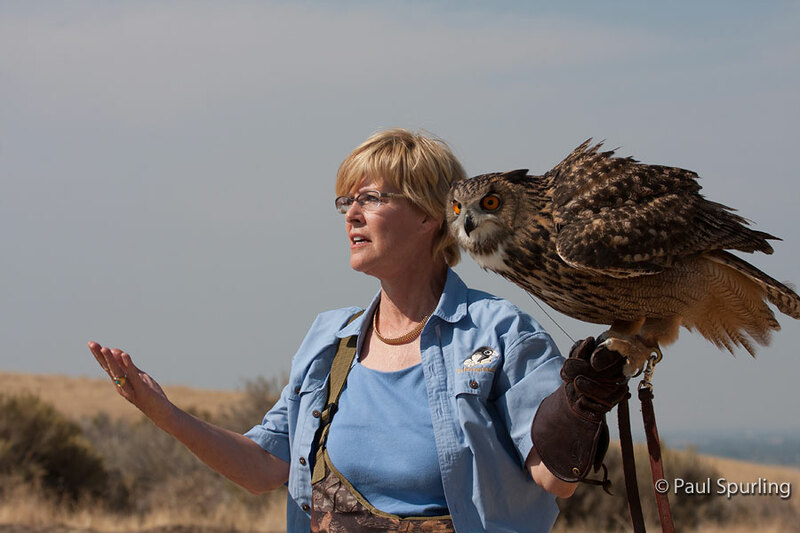 These sounds give away the location of prey animals, making it easy for these owls to deftly swoop in to catch a meal. Eurasian Eagle-owls may be found nesting on ledges, in cave entrances, and within rock crevices on cliffs. They also sometimes use the abandoned nests of other large birds, such as ravens or eagles, and some even nest on the ground. After the female lays her eggs, she spends most of her time incubating them to make sure that the young develop well inside the eggs and hatch into healthy chicks. Meanwhile, the male is responsible for finding food and bringing it to the nest. He will continue this important role after the chicks hatch. When they first break free from their eggs, the young birds are small, white fluffy balls of down with dark beaks. They open their bright eyes for the first time several days after hatching. Eurasian Eagle-owl nestlings grow quickly, which means that the parents must work hard to keep them fed and well-nourished. In just a short seven weeks after hatching, or less, the young reach nearly adult size and are ready to fly. At first, they make short practice flights as they gain strength, agility, and confidence. They remain in their parents' territory for another another 3-4 months before leaving home and looking for a territory of their own. When these young Eurasian Eagle-owls reach 2-3 years of age, they will be able to find a mate, nest, and produce their own young. 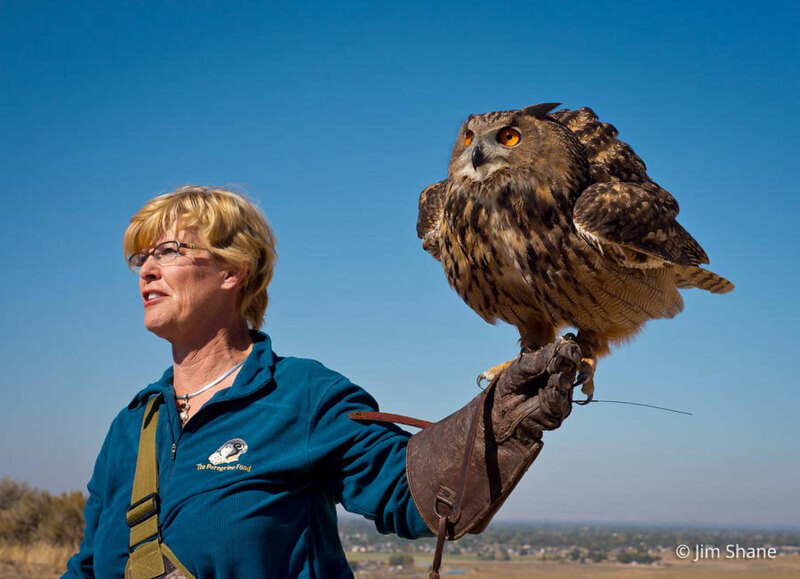 At our World Center for Birds of Prey in Boise, Idaho, we have a Eurasian Eagle-owl named Wally that helps educate visitors about his species and owls in general. He is a big star in our fall flight shows and is on display year-round in our visitor center. He loves visitors!